New in 2008 model QR-OTS-U allows you to mount any cylinder from an "M" through a "J". The system uses a QR-MV Multiversal bracket to accommodate the range of cylinders. Now all medical oxygen cylinders may be mounted using the QR-OTS-U. 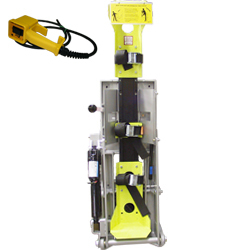 Powered by a single electric actuator meeting UL-1500 Standard for Ignition Protection, the unit has a maximum lifting capacity of 160 pounds and requires 12 VDC with 14 amp circuit. Basic device requires a mounting area of 18-1/8" W x 37-5/8" H x 12-3/4" D. Minimum door opening is 14". Operating latch is on the same side as the motor. Please see QR-HHS/B for optional hand held switch and 3030-135-135, 3030-135-138 for replacement straps. Dimensions for storing "M" cylinders will vary with length of cylinder. QR-OTS-R-US includes hand-held switch in place of the standard toggle switch. Mounting bracket provided.